Many students find that when they come to University they need to change their habits when it comes to finding information. Out go Wikipedia and generic search engines and in come high quality sources of information. But where do you go to find these high quality sources? If you’ve attended an IS induction session you will have been introduced to what follows – so it’s a reminder for those that have attended, and a quick start for those that have arrived late or didn’t manage to fit one in. From here you can access information on all the services provided by IS, including your free Microsoft Office 365 download. Why not mark this web address as one of your favourites so you’re only ever one click away from help. Our favourite option, of course, is when you come in and see us in person! So if you need help finding information, make the trip to your Library. Your first port-of-call is our friendly and helpful staff at the Library Service desk, who will either be able to help you straight away or point you in the direction of someone who can help you. Each school in the University also has a Subject Librarian. Click your school to find out who your Subject Librarian is. 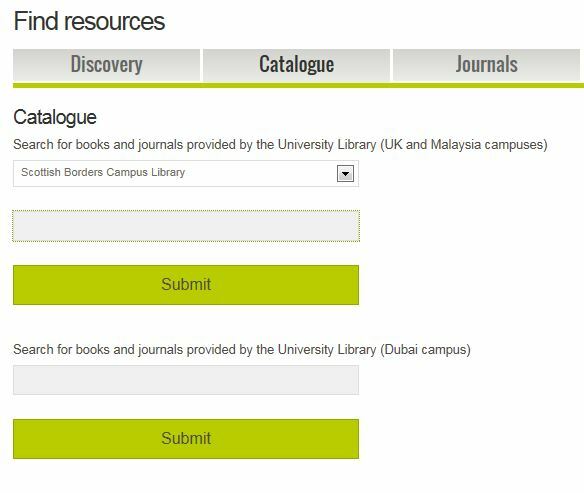 Go to Find resources and select Catalogue. Choose where you want to search, type in a subject, a title or an author’s name and click Submit. The Catalogue will search for print and electronic books and journals. You can also use the Library Catalogue to check your own account online and renew any items you have on loan. Did you know that the University provides you with thousands of online journal articles, e-books and more right at your fingertips? Go to Find resources and select Discovery. Type in a subject or author and click Submit – DISCOVERY searches across all of the resources the University pays for and more. Our electronic resources can be accessed both on and off campus – see On/off campus access for details.